Mention spring break, and visions of thousands of college students partying on Florida beaches often come to mind. But several Shawnee State University students took a different approach to spring break, volunteering instead to travel to Myrtle Beach, S.C., as part of an Alternative Spring Break class led by Gabriel Brown, adjunct faculty and 1st Generation mentor. The class is a service-learning course that explores the history and culture of Myrtle Beach, and focuses on community engagement. Service projects included community restoration by helping the New Directions homeless shelter, the North Myrtle Beach Historical Museum, and beach cleanup. 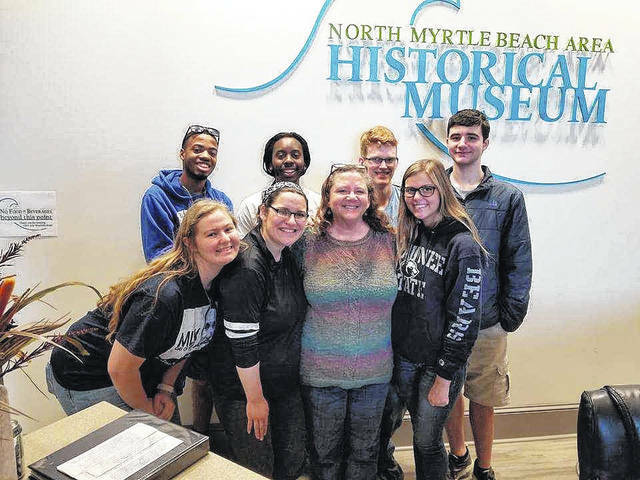 Students focused their attention on empowerment, place-making and asset-based community development, while learning about the history and culture of Myrtle Beach. Goals of the course are to help students develop leadership skills through the role of “servant-leader,” encourage students to examine the role of service to others, increase awareness of the needs of individuals in underserved communities by applying empowerment strategies, increase understanding of asset-based community development and actively engaging in service-learning. The seven students in Brown’s course are Ethan Clarke, Lamont Garris, Aaron Lemaster, Summer Morgan, Trent Patterson, Maria Renteria and Rachel Roar.